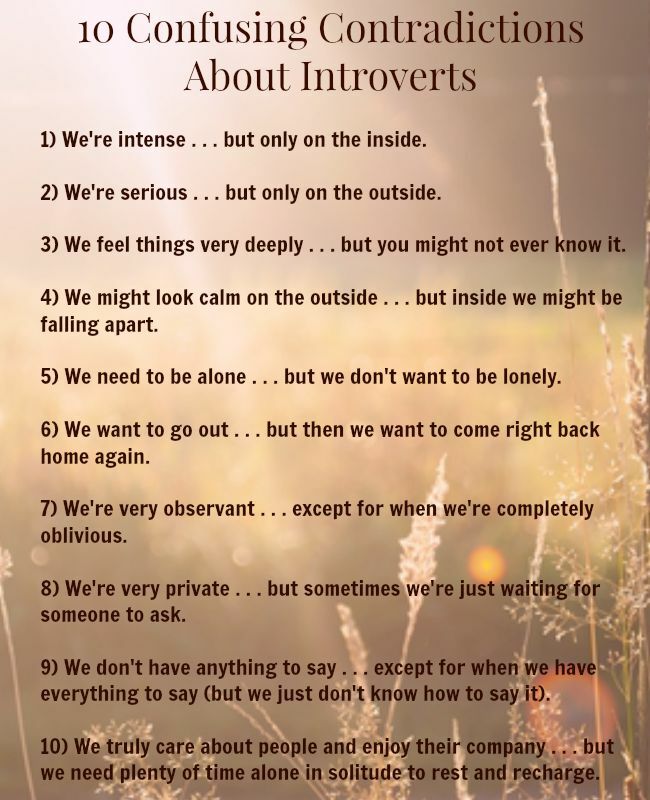 Everyone is different, of course, and these might not all apply to every introvert out there, but, in general, these are some of the most common contradictions that can make our introverted personalities so confusing at times. 1) We’re intense . . . but only on the inside. We’re pretty intense people, really, but our intensity is an inward intensity. We feel things deeply, we think about things deeply, and we often have strong opinions about things, but our intensity isn’t an obvious outward one. It’s subtle and internal. 2) We’re serious . . . but only on the outside. Most of us probably seem fairly serious on the surface, but we really aren’t as serious as we seem to be (or at least not always.) We do tend to take things seriously, but our minds are often very playful and imaginative, and as serious as we may appear on the outside, our internal world is usually a different story. 3) We feel things very deeply . . . but you might not ever know it. 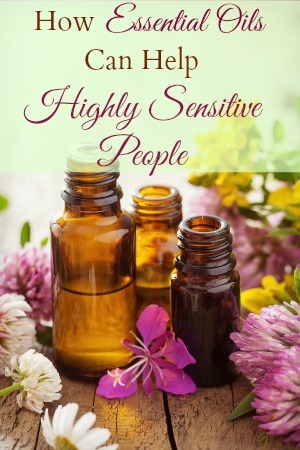 We feel things very deeply (especially for those of us who are highly sensitive introverts), but we don’t tend to wear our hearts on our sleeves, and we’re often pretty reserved when it comes to expressing emotions, so our depth of feeling usually isn’t very obvious to most people. 4) We might look calm on the outside . . . but inside we might be falling apart. I think this one is probably one of the most confusing contradictions of them all. 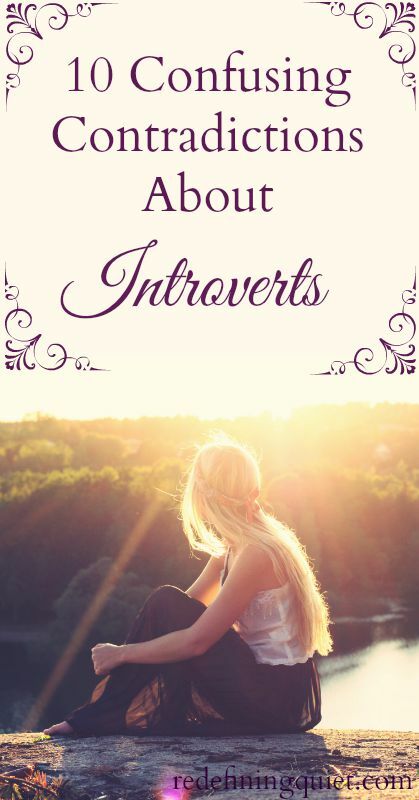 Since most introverts are pretty quiet people, we often seem calm on the outside. And we are, in a way. We’re not usually bouncing off the walls with energy like some people are. And our more reflective, observant nature gives us a certain calmness, too, because we usually “look before we leap” rather than jumping right into action. 5) We need to be alone . . . but we don’t want to be lonely. Having quiet time alone isn’t an option for us. It’s a necessity. But, at the same time, we also need to feel connected to other people. It’s often hard for us to balance our need for solitude with our desire to avoid loneliness and connect with others. 6) We want to go out . . . but then we want to come right back home again. Sometimes the idea of going out seems more fun than the actual act of going out. It’s not that we’re antisocial, but we just reach our level of overwhelm sooner. As much fun as we might be having, we start to feel that inevitable energy drain and we find ourselves wanting to go somewhere quiet so we can recharge. We love having fun, but we love (and need) quiet evenings at home too. 7) We’re very observant . . . except for when we’re completely oblivious. Most of the time, we introverts are pretty good at noticing things and picking up on subtle changes or details. But then other times we’re so caught up in our own daydreams and over-analyzing things in our minds that we’re completely oblivious to what’s going on around us. 8) We’re very private . . . but sometimes we’re just waiting for someone to ask. 9) We don’t have anything to say . . . except for when we have everything to say (but we just don’t know how to say it). Maybe you’ve seen the pictures floating around social media with the image of an iceberg and the caption “What I say” at the tiny tip of the iceberg and “What I think” at the enormous base buried under the water. That’s exactly what we’re like when it comes to conversation. It’s not that we have any lack of words swirling around in our minds. It’s the fact that we often have a hard time finding the words we’re looking for when we need them. (And, of course, we usually think of the perfect thing we could have said a day later.) Sometimes it’s frustrating, and sometimes it saves us from saying something we might have regretted. But either way, the amount of words we say is usually only a tiny fraction of what we were thinking. 10) We truly care about people and enjoy their company . . . but we need plenty of time alone in solitude to rest and recharge. It’s a myth that introverts don’t like being around other people. We really do enjoy being with people, and we really do care about them. We just need some time alone, too. It’s all about finding the right balance for us. If we are able to have the time in solitude that we need, we’re much better able to enjoy the time we spend with others and we’re much more companionable to be with, too. 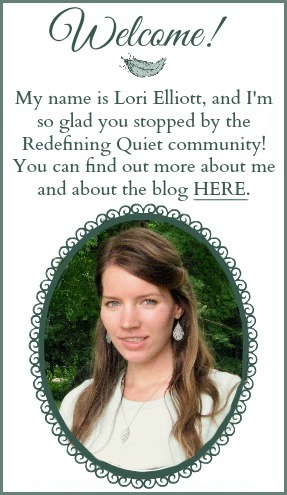 An introverts downtime is for the benefit of everyone! 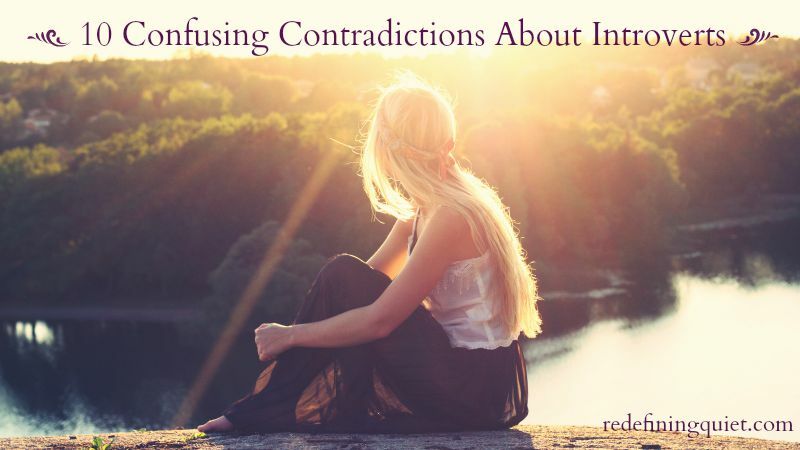 What introvert contradictions can you think of? Let us know in the comments!